. Today we’re excited to not only launch Web Fonts to ALL Blogger users, but also announce we’ve added an additional 35 fonts to the mix, for a grand total of 77 fonts! Henry Ford once said “Any customer can have a car painted any colour that he wants so long as it’s black.” When it comes to the Internet and fonts, sometimes this hits pretty close to home: “You can use any font you want so long as it’s Arial.” With the introduction of Web Fonts, this is now a far cry from the truth! Web Fonts, brought to you by our good friends at Google Fonts, let you spice up and further personalize your blog. Just have a look at what we’ve done with the post titles of this blog! And for those of you interested in fonts for non-latin alphabets such as Cyrillic, Greek and Khmer, we have those too! Ready to give it a try for yourself? Simply go into the Advanced tab of the Blogger Template Designer for your blog, select the type of text you’d like to change (Post Title, Blog Title, etc.) and click on any of the new Web Fonts for a preview. Don’t worry, nothing will change on your blog until you select “Apply to Blog”, and this means you can play around with all of the fonts and only make the switch when you’re ready. For the full list of fonts and more information, please take a look at the Web Fonts page in our Help Center. Go ahead. Jump over that lazy dog! 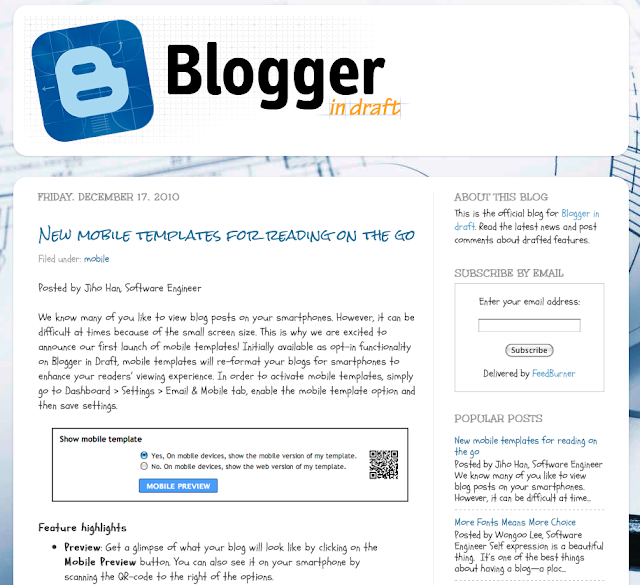 A couple of months back we introduced Web Fonts to Blogger in Draft. Today we’re excited to not only launch Web Fonts to ALL Blogger users, but also announce we’ve added an additional 35 fonts to the mix, for a grand total of 77 fonts!